Gabriel Chavez ’14 (Radiologic Sciences) couldn’t hold back tears. It was a simple question that led to his emotion. It was as if the last 20 years of Chavez’s life flashed in front of him in seconds. He thought of his family and how much they gave to him. How appreciative he was, even if his Christmas gifts as a child were not toys, but socks. How the military helped him mature into a man. And how California State University, Northridge educated and put him on the path toward a career. “My mom told me, ‘Whatever you give, you get twice in return.’ And it’s always stuck with me,” Chavez said. Chavez created the Sergeant Gabriel Chavez Scholarship Fund at CSUN, which will be awarded annually for five years and go to a deserving CSUN student veteran. His return for “giving” is an overwhelming feeling of satisfaction. Chavez said he is helping someone else — like he was helped. While a student at CSUN, he received various scholarships and received the honor of the Mike Mahony Marine Corps Veterans Scholarship in 2013 and the Outstanding Veteran Award in 2015. The opportunity to impact other lives drives Chavez, even if he leads a simple life. Chavez was born in Mexico — the 10th of 11 children and first to be born in a hospital. He also was the first to have something resembling a bed. Meals, more often than not, consisted of tortillas, beans and water. Chavez’s walks to school were a couple of hours long. During the early years of his life, his father lived in the United States trying to establish residency for the family. Eventually, the family established roots in California. His parents, Luis and Olivia Chavez, worked in the fields picking fruits and vegetables. His childhood years were full of tumult. He was unhappy, often got into fights and ditched school. He began to battle with his father. Then, late in high school, he made a choice. It was that moment that Chavez decided to enlist. While in the Marines, Chavez tore a tendon in his wrist, and it changed the trajectory of his life. He could no longer perform the duties required of him by the Marines and was medically discharged. He ended working in banking, but he wasn’t satisfied. He wanted more out of his life. Remembering how fascinated he was when his wrist was imaged under fluoroscopy, he looked into getting a degree in radiologic sciences. The first step was going to Los Angeles Mission College. Chavez gives much credit to Mission College counselors and professors for pointing him in the right direction. Chavez was all-in at CSUN. In addition to his education, he got involved with the newly formed Radiologic Sciences Alumni Chapter as a student representative. Hope Martinez, a founding member of the chapter, said she had heard of Chavez prior to his work with the chapter because of the impression he made on her husband while working for him at Northridge Hospital to fulfill his clinical education requirements. “My husband has high standards, and he talked about Gabriel, and how good he was as a student,” Martinez said. Chavez also made a lasting impression on Martinez, with his dedication and passion to helping the chapter as a student. After earning his degree from CSUN he remained devoted to the chapter as a member. Martinez has a thought as to why Chavez, a man just beginning his career, is so committed to helping fellow alumni and students through the chapter. Chavez said Martinez and Bob Ortego, the president of the radiologic sciences alumni chapter, were big influences on him and helped steer him on the path that he is on now. 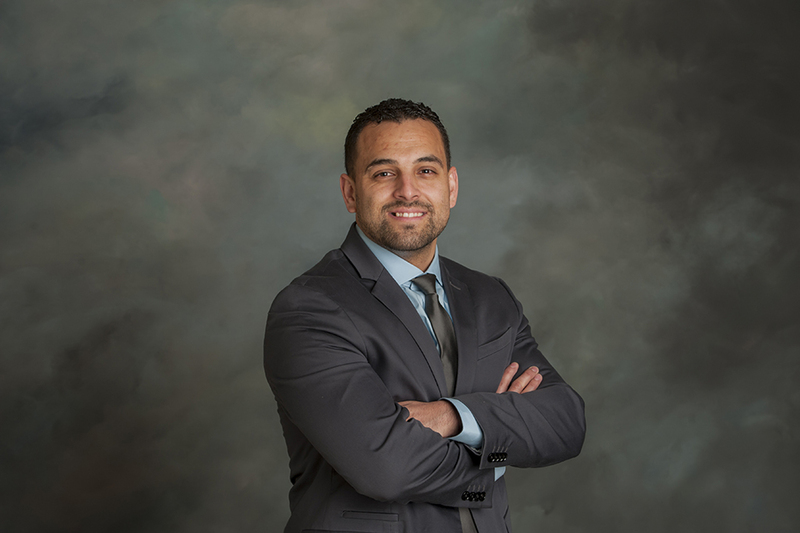 He now works for Martinez and Ortego in the Los Angeles County Department of Public Health as a radiation protection specialist and primarily inspects X-ray equipment. The job has allowed Chavez to purchase his first home and, in his typical giving ways, he has brought in his mother and two adult nephews. At 31 years old, with all of this responsibility and just three years out from his graduation from CSUN, he decided to set up the scholarship. Chavez earns a modest living, so it was a sacrifice for him to provide. But to him, it’s worth every penny because, as a student, he benefited from others giving back to him. He believes that maybe, someone who has a similar story to him can not only benefit, but pay it forward.